Over the last few decades, David Lynch (Blue Velvet, Dune) has crafted a public image as a friendly, charming, somewhat goofy eccentric. This belies the fact that he has made several of the most viscerally disturbing and brilliant films in cinema history. Lynch’s 1977 Eraserhead, his first feature, is on the top of the pile — a hand-crafted avant-garde masterwork that works as a satire, a fantasy and a filmic nightmare. This Criterion edition of the cult favorite improves upon Lynch’s own “Eraserhead 2000” DVD release (sold through his website) with an excellent restoration of the film and a veritable truckload of supplemental materials (except chapter stops — Lynch does not like chapter stops). The first of these is a “TV calibration” test in which the viewer is asked to fine-tune the brightness and contrast on their TV set in order to see the darker moments in the film. The technical tinkering that Lynch requests here is very much in keeping with the true nature of Eraserhead — the film is as much of a sensory experience as it is an Expressionist version of the “American Dream” gone horribly wrong. Lynch’s intricate sound design is one of the crowning glories of the picture (especially given the limited budget he was working with). The film’s narrative functions solely by dream logic: our uber-schnook hero (Jack Nance) is hesitant to marry his girlfriend Mary (Charlotte Stewart) but is persuaded to by her parents, who inform him that Mary has had a baby that is his. The “baby” is in fact an odd-looking mewling creature that both Mary and Henry have trouble caring for. When Mary leaves him, Henry succumbs to the charms of a seductive woman across the hall (Judith Roberts) and is entertained by the mystery “lady in the radiator” (Laurel Near). 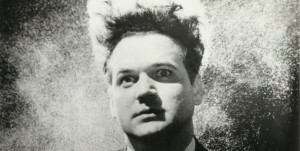 Jack Nance stars in David Lynch's Eraserhead. In the longest supplement here, “Eraserhead Stories,” Lynch refers twice to the film being highly “personal” to him. In the booklet accompanying the two-disc set, he denies (in an interview taken from the 1997 book Lynch on Lynch by Chris Rodley) that the storyline was inspired by his experiences as a young dad caring for his daughter Jennifer (later the director of Boxing Helena), who was born with club feet. 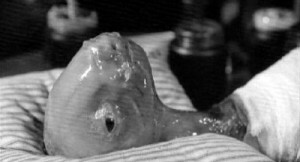 In fact Lynch has always refused to “explain” the actions and imagery in his films, but he is more than willing to tell stories about the creation of his films and the low-budget methods used to create certain effects (except the “baby” — he outright refuses to discuss how that creature was created). The supplements here contain no end of Lynch and his confederates discussing the behind-the-scenes details of the film and its very unusual five-year creation. The first extra on the second disc is an incredibly rare B&W videotape interview of Lynch and cinematographer Frederick Elmes made for a TV production class in 1979. The interviewer asks very pointed questions about the picture, going so far as to quote negative newspaper reviews. Lynch’s responses are not as measured and charmingly evasive as they later became — he openly declares that it is an “open-feeling film” that can be interpreted however the viewer sees fit. Most importantly he notes that the characters “live in their own time” and that the film is intentionally abstract. A 1988 sequence from a French TV documentary finds Lynch and Jack Nance driving to one of the film’s locations and discussing the job that Lynch took while he worked on the film: a paper route for The Wall Street Journal (Lynch was in his late 20s at the time). The duo is seen again, this time with Lynch’s assistant Catherine Coulson and Charlotte Stewart, in an anecdote-packed segment from the 1997 docu Pretty as a Picture. Here we get a capsule version of the five-year production of the film, as Lynch and his cast and crew shot the picture in stables owned by the American Film Institute, where they were basically left on their own to shoot the picture whenever they wanted (when Lynch’s marriage broke up, he took to living on the premises). Thus, Eraserhead was primarily shot in the late evening hours. Coulson (best known as “the Log Lady” on Twin Peaks) provides some of the most interesting anecdotes, noting that her marriage to Nance most likely crumbled because she had the daunting task of giving him the Eraserhead hairdo every time they were shooting. She also mentions the oddest items she obtained for Lynch, which included real umbilical cords — she went to a local hospital and waited outside maternity wards where the medical personnel simply gave her fresh ones. Coulson is also the centerpiece of the other two “storytelling” supplements. She, Stewart, Roberts, and Elmes talk about the production in a new featurette made for this release. Coulson emphasizes that the nicest thing Lynch did for his small crew was to give them percentage points, meaning to this day they receive checks for the film. The longest supplement is an 85-minute documentary that Lynch created for the “Eraserhead 2000” release. “Eraserhead Stories” features him alone in a recording studio in front of a curtain talking into a studio microphone while looking slightly off-camera, delivering anecdotes in his inimitable style. Many of the stories he tells are duplicated in the Rodley interview included in the booklet, but it’s far more entertaining hearing Lynch’s childlike sense of wonder as he deftly veers off from a discussion of the film’s production to rhapsodize about his cinematographer’s driving and aviation skills, or his favorite meals. Lynch includes (who else?) Coulson in the mix by having her talk on a speaker phone, reminding him of certain things he’s forgotten. The one invaluable element in “Stories” are old b&w videos that were shot as the film was in production. As if all that weren’t enough, more of Lynch and his large-size studio mic can be seen in the collection of early films included in the package, which was initially released on DVD as The Short Films of David Lynch (with one film missing here, “The Cowboy and the Frenchman”). The collection includes Lynch’s wonderfully idiosyncratic intros, three of his student shorts (“Six Men Getting Sick,” “Alphabet” and “The Grandmother”), a video experiment (“The Amputee,” starring Coulson and Lynch himself) and his brilliant, minute-long contribution to the feature Lumiere and Company (1995). The only thing missing from this collection is any mention of Laurel Near, the folksinger who played the “lady in the radiator.” She isn’t talked about or heard from, but her character is helpfully described by Lynch as “a beacon of light” in the 1979 video interview. Perhaps the single most interesting thing about Lynch’s works is how deeply disturbing they are, and how relentlessly cheerful their creator is.